Thanks to machines with modular construction and additional equipment, you can increase the efficiency of intralogistics processes. The logistics center of one of the three largest bicycle manufacturers in Europe – Derby Cycle, is a perfect example. That’s where VNA forklifts helped to transport non-standard platforms in a warehouse. Derby Cycle is a company based in German Cloppenburg. Its shares are listed on the Frankfurt Stock Exchange, and brands such as Kalkhoff, Focus, Rixe, Univega, and Raleigh have been known to amateurs of two wheels in many European countries. Over the years, not only key brands changed, but also ways of order fulfillment. As a result of pressure to limit distribution costs, it became necessary to consolidate warehouses, as well as mechanize and later automate the processes carried out in them. One of the effects of this pressure is also the recent centralization of distribution and entrusting the management of the issues of transport and forwarding to a specialized entity. Hellmann Worldwide Logistics has created the concept of a global warehouse and supports it on a regular basis, responsible for the entire supply chain, including for imported parts, transport between production plants, distribution center and for transporting ready-made bicycles to dealers in dozens of countries. The global Derby Cycle distribution center is a high bay warehouse that can hold up to 150,000 bicycles. They are stored in 48 rows of 8-story shelves divided into 24 narrow alleys. The total area of the logistics part is about 25 thousand square meters. Andreas Bothe, head of the Hellmann branch, emphasizes that thanks to an individualized logistics concept, up to 5,000 can be processed. bicycles a day, from one central distribution point, dealing with seasonal variations typical for the bicycle sector. Due to the way of packaging of bicycles, conventional pallets are not used here. 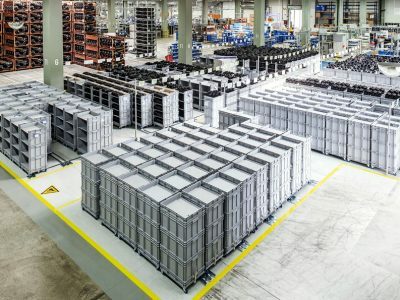 Longitudinal, flat boxes with goods are slid onto shelves directly from custom-made platforms, for which the operating VNA forklifts have been adapted. For the needs of the Derby Cycle logistic center, Still produced eight dedicated MX-X series VNA forklifts designed to carry non-standard work platforms. The construction of their forks was adapted to transport platforms on which there are packages with bicycles and an operator handling unloading and picking. They were enriched with a special blockade, which is to ensure the stability of the structure, ease of operation, and guarantee safe work. The operator can safely select the desired goods by moving up to 10 m above the ground. The vehicles have an automatic driving system based on the induction thread. Thanks to it, the trolleys are able to independently navigate between the bookshelves – so that the operator can work without any obstacles from the platform, not from the cabin. After completing the picking based on the semi-automatic VNA modular carriages, the loads are transported to the trucks with the help of the leading electric trolleys of the RX 20 series. All means of transport operating in the central warehouse were integrated with the fleet management system, recording the working time of individual vehicles. Reports are generated automatically, based on them you can analyze the machine coverage on an ongoing basis and even out the differences between them, appropriately allocating tasks. The created concept of the magazine provides a good insight into the current situation, increases the flexibility of processes, allows you to save storage space, time and money in the distribution center. 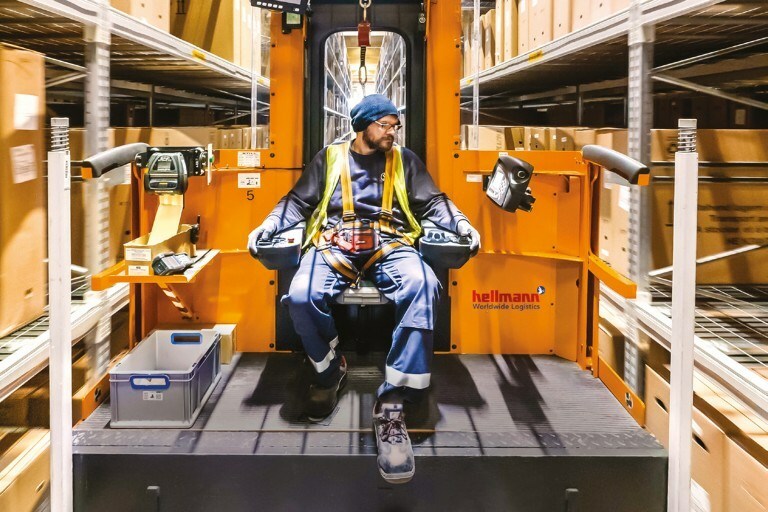 MX-X trucks with the Optispeed 4.0 navigation system increase the safety and efficiency of picking in narrow aisles, and FleetManager gives you full transparency on fleet data,” says Andreas Bothe from Hellmann. The high storage rack covers the whole space inside the hall, up to the ceiling. To enable the use of the lowest levels of racks, order pickers are operated without mechanical guidance and run on guide wires. Optispeed 4.0 is a kind of warehouse navigator. It optimizes the working parameters of vehicles during specific operations and also has a semi-automatic function of approaching the target storage locations, which has an impact on performance. 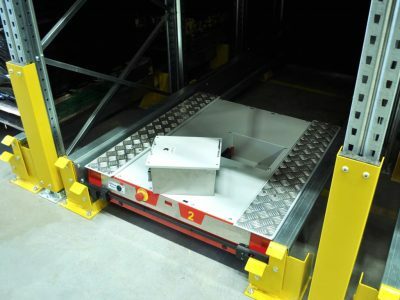 We are able to automatically adjust the lifting height to a given task by retrieving the load from the target position. Spotlights illuminate the correct storage position. This avoids errors and time-consuming searches,” explains Lars Lemke, responsible for the navigation system project at Still. 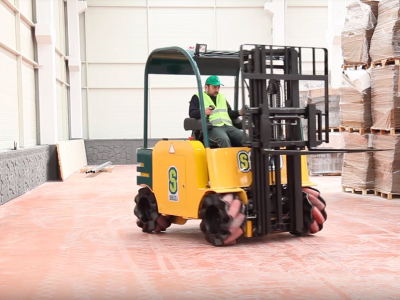 Thanks to this, the operator can concentrate better on tasks related to storage and order picking. The solution currently used in Derby Cycle is nothing like the previous one. In the former main warehouse, in Quakenbrück, bicycles were stored on metal racks, one on top of the other. A lot of time was consumed, for example, by choosing a specific assortment. 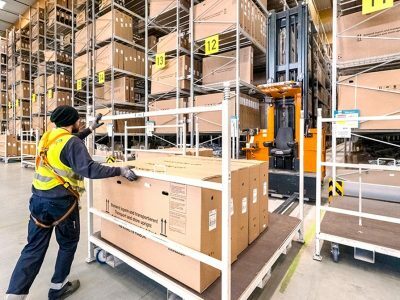 An additional driving force behind the changes was a huge increase in demand for electric bicycles, it was necessary to find an additional place for their storage, as well as for storing the batteries,” adds the host of the warehouse.